verfügt über 3 ausgezeichnete Golfplätze, aber wenn es der Strand, die Sie lieben, erstreckt sich der Ozean für Meilen und ist nur eine 5 Minuten zu Fuß entfernt. mit Whirlpool, separater Dusche und New 32 'LED TV; der Gast BR hat 2 volle Betten, Whirlpool, Dusche und TV / DVR / DVD. Der große Wohnbereich bietet eine Rundum-Sicht und öffnet sich zu einem abgeschirmten Veranda mit Blick auf die Tennisplätze. LR hat auch neue Möbel (2013) inkl Sofa, Sofa-Bett und Seiten Stuhl und 40 'LED TV, Videorecorder und Blu-ray DVD. We had a great time on our vacation. The living room, kitchen, dining room of this villa is super open and has a nice space to have big family dinners and game nights together. We had a couple of issues and Phil was very easy to contact and willing to handle these issues right away. Always a fantastic time. 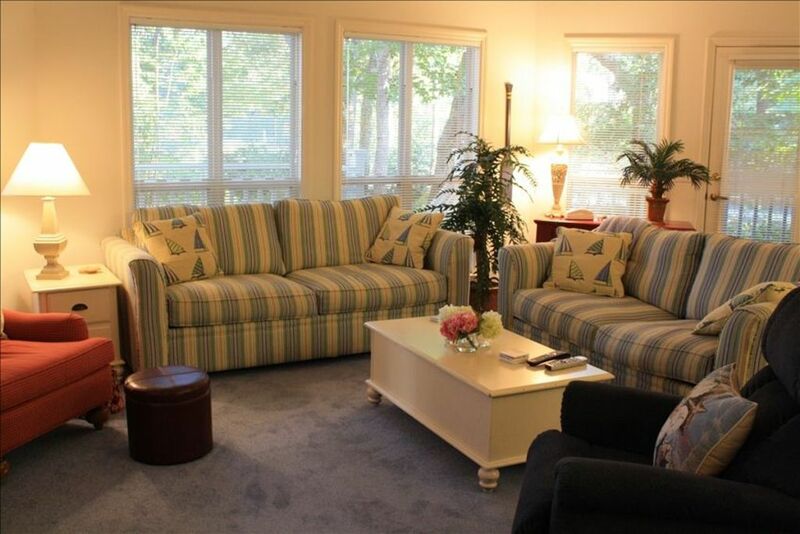 An easy space to retreat as a family after beach/golf/tennis fun. We will be returning many times. Had a great time and will come back for sure! This will be our 5th straight year renting from Phil and our 4th year at this villa. The location is great with a clean 1st floor status. The beds are comfortable and I am a full figure man. the kitchen has quality kitchenware, silverware, dishes and glass ware. My 93 year old mother-in-law loves the recliner. But more importantly Phil is always responsive to our needs. With tvs in living room and bedrooms and the cozy feeling of home at a reasonable price, I just sent my deposit for the month of March 2018. We love HH and were very pleased with our first visit in this unit. Accommodations were generous and the tennis was literally out the back door. After a nice morning workout, the beach was very accessible by a short drive or reasonable walk. A little noise from upstairs but that's life in this environment this time of year. The unit itself was clean and kept, and very comfortable for our family of 6. The pool is also a short walk and didn't see much traffic when we were there. Overall a great place to stay, we will likely return. The unit itself is laid out nicely,very nice floor plan. The unit has nice furniture. There was a lot of negatives as the whole unit was full of dead bugs all along the walls, window ledges under blinds and behind or under furniture. Very large roaches or Beatles and Spiders in addition we constantly were killing bugs. I would suggest a bugs pray on premises. The pull out sofa had dirty sheets on it! It was disgusting! The kitchen is very disorganized with the items provided and they are very old and damaged as far as utensils. We went out and purchased plastic silverware because this silverware is so gross. Everything is thrown in drawers and jammed into a drawer. The pots/pans provided were adequate but again there is no sense of organization because nothing is clearly organized or maintained. They did not provide any starter laundry detergent. There were no Large Kitchen trash bags provided for the week. You would think there would be at least 2 bags in the tall kitchen trash can. The kitchen floor was filthy when we arrived. There was no Lysol or Windex or anything to wipe down counters provided. The back porch/screened in area was not really enjoyable due to the large amount of bugs dead and alive. There were so many cob webs and spider webs on porch and furniture it needed to be swept and hosed down. It just felt like there was no one overseeing the unit or its upkeep. The AD/posting for this unit indicated we had access to the Westin shuttle/transportation and that is NOT really true, yes we could get on it if it was there but we could not call for the shuttle as the shuttle comes in for Ocean Palms Guest NOT Crown Reef and if we took the shuttle from the beach back to the unit we had to say we stayed at Ocean Palms so this is falsely advertised and communicated. There are no outdoor girls and no hoses for your beach gear to hose off. We arrived to find the outside trash overflowing and full gates were open and trashed had been strewn thru area by animals trash collection did not come until Weds. Overall the beach was enjoyable and we made the best of it. It could have been worse. I would not stay in this unit again. Our initial reaction to this extremely negative review, including dirty and bug-strewn conditions throughout the villa, is that we certainly would not have been able to rent this unit at all. But to the contrary, we have been booked virtually 100% of the time. The extent of the uncleanliness found by this reviewer suggests that our villa was not cleaned at all after the tenant just prior. This is possible but has never previously occurred during the 4+ years we have owned this unit. With regard to roach and other insect control, we like all other renters on Hilton Head have a contractor who comes in for pest control on a monthly basis. We have replaced virtually all plates, pots and pans, silverware and most counter-top appliances in the kitchen. We purchased a new dishwasher this past March and at the same time bought a new couch, chair and sofa-bed for the LR. We have spared no expense in keeping our villa comfortable and up-to-date. It is disturbing to have received such a negative review and, of course, we look into all complaints. We would also like to submit the review of our tenants for the week of May 4, a little more than a month ago: "Thanks so much for renting your beautiful condo to us. It was everything you told us it would be and even better than the pictures. We totally enjoyed the condo and the location. When we return to Hilton Head we most definitely will give you a call."